Electrochemical Sensor Analysis (ECSA) presents the recent advances in electrochemical (bio)sensors and their practical applications in real clinical, environment, food and industry related samples, as well as in the safety and security arena. In a single source, it covers the entire field of electrochemical (bio)sensor designs and characterizations. The 38 chapters are grouped in seven sections: 1) Potentiometric sensors, 2) Voltammetric sensors, 3) Electrochemical gas sensors 4) Enzyme-based sensors 5) Affinity biosensors 6) Thick and thin film biosensors and 7) Novel trends. 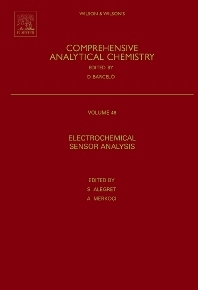 Written by experts working in the diverse technological and scientific fields related to electrochemical sensors, each section provides an overview of a specific class of electrochemical sensors and their applications. This interdisciplinary text will be useful for researchers and professionals alike.